Reference number for this case: 29-Sep-54-Saint-Dizier. Thank you for including this reference number in any correspondence with me regarding this case. Since then we read in the newspapers that Mr. the Mayor of St-Dizier and a railwayman of Ancerville had also seen it at the same hour this same Wednesday. A person told us, as well as his wife, to have seen a luminous object like the Moon, but a little smaller, hovering in the direction of Bar-le-Duc. Mr. RAOUL LAURENT (left) is the mayor of Saint-Dizier. Last Wednesday, September 29, about eight in the evening, when he had just left the City Hall, he saw in the starry night sky a bright light that was moving at a very high speed. He clearly distinguished an elongated shape similar to that of a cigar, leaving behind a trail of light (see the drawing above). The craft must have been at a probable altitude of several thousand meters. The mayor saw a cigar. M. Raoul Laurent is the mayor of Saint-Dizier. Last Wednesday (Sept. 29), about 8:00p.m., when he had just left the city hall, he saw in the stormy [sic] sky a bright light moving at high speed. He could plainly distinguish an elongated, cigar-like shape. Leaving a luminous trail. The craft must have been at an altitude of several km. Loren Gross indicates that the source is the newspaper France Dimanche, for October 10, 1954, and provides a copy of the article [fd1]. No. 4. The mayor saw a cigar. M Raoul Laurent is the mayor of Saint-Dizier. Last Wednesday (Sept. 29), about 8:00 p.m., when he had just left the city hall, he saw in the stormy sky a bright light moving at high speed. He could plainly distinguish an elongated, cigar-like shape. Leaving a luminous train. The craft must have been at an altitude of several km. Luc Chastan indicates that in the Haute Marne in St Dizier on September 29, 1954 at 23:30 hours "The mayor of the city observes a luminous object. " The source is indicated as "Lumières dans la Nuit numéro 259/260". The website indicates that on 29 September 1954 at 20:00 in St-Dizier, France, "An unidentified object was sighted, but with appearance and behavior that most likely would have a conventional explanation. One object was observed by six witnesses for a few seconds." The sketch in France-Dimanche seems dubious: the City Hall in Saint-Dizier does not have a building on the side with this tower, and there is a square in front of it, and no visibility to it from 50 meters inside rue de la Victoire. The "old Middle-Age Castle", which became the Sous-Préfecture in 1959, has two towers but was never used as the city hall, the building being the same since it was built in 1824. The sketch shows a crossing of "rue de la Victoire" and "rue des Alliés", but though the latter seems to have existed, in Saint-Dizier, I am unable to locate it now. From the "rue de la Victoire", I am not in front of the city hall but behind it and it is hidden from view by other buildings. 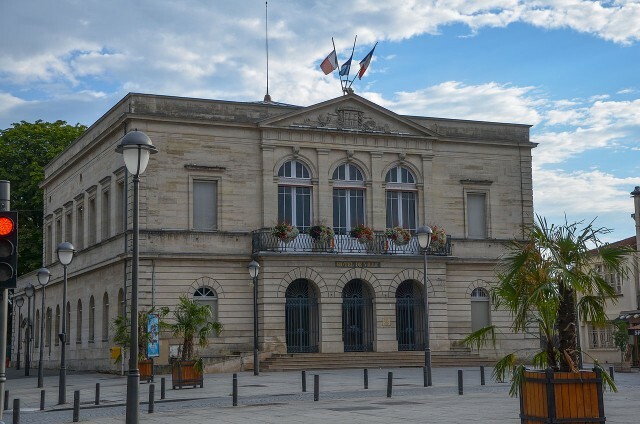 So I wonder whether the Mayor of Saint-Dizier, Raoul Laurent (he was indeed the Mayor then) was really in Saint-Dizier when he made the observation; maybe he was coming out of the city hall of another city... And I am thus unable to find the direction of observation. 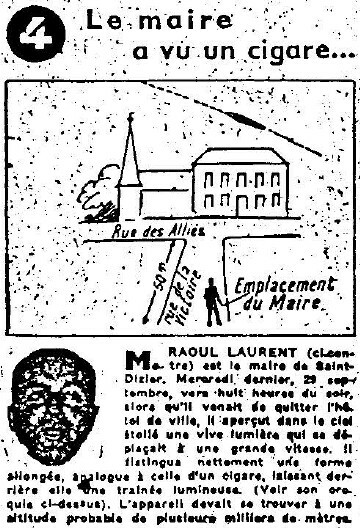 [fd1] Article in the national newspaper France-Dimanche, Paris, France, October 10, 1954. [lg1] "The Fifth Horseman of the Apocalypse - UFOs: a History - 1954 October - Supplemental notes", by Loren Gross, USA, page 17, 2002. [lg3] "The Fifth Horseman of the Apocalypse - UFOs: A History - 1954 September Supplemental Notes", monography by Loren E. Gross, USA, pp 9-10, 2002. 0.1 Patrick Gross September 17, 2007 First published. 1.0 Patrick Gross February 18, 2010 Conversion from HTML to XHTML Strict. First formal version. Addition [ud1]. 1.1 Patrick Gross September 30, 2014 Additions [fd1], [lg1], [ub1]. Explanation changed from "Not looked for yet." 1.2 Patrick Gross December 16, 2016 Additions [lg3]."